Last week, the Fraser Institute reported on some rather alarming numbers with regards to the tax burden of the average Canadian family. As the ominous graph below indicates, the Canadian tax bill has risen a whopping 1,832% since 1961. That is a monstrous increase; such an upsetting trend in policy is absolutely outrageous! Actually, the only thing outrageous here is the lack of context. There really is nothing alarming here; more aptly, this is an alarmist piece of propaganda put out by masters in the trade. As most of the major Canadian media outlets re-broadcast the essence of the report with minimal comment, I feel it is well worth providing a review of their numbers. 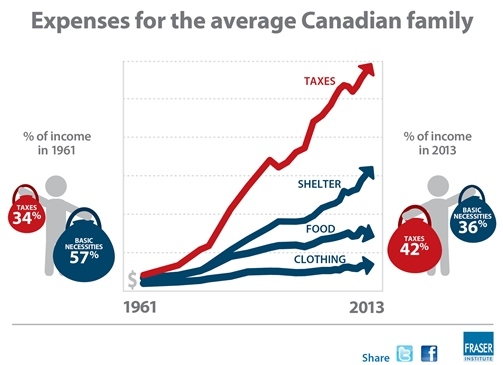 First off, among the major points made in the release – and notably being at the core of the alarming graph – is that “the average Canadian tax bill has increased by 1,832 per cent, dwarfing increases in shelter costs (1,375 per cent), clothing (620 per cent) and food (546 per cent)”. Now, though these numbers are likely accurate, there really is no sense in reporting monetary comparisons over time if you don’t account for inflation. Between 1961 and 2013, inflation would account for a 683% change in prices (according to the Bank of Canada Inflation Calculator). Nevertheless, after providing these large numbers for dramatic effect, author Charles Lamman does note that ‘even after accounting for changes in overall prices (inflation) over that period, the tax bill shot up 147.0 per cent.’ OK, now we’re getting somewhere: 147% still sounds like a huge tax increase. But wait a second, those helpful stick men with the money bags show that the proportion of our income going to taxes has risen from 34% to 42% (which is a 24% increase, not a whopping 147%). Well, as it turns out, it is the family income that has increased most dramatically. Back in 1961, the workforce was 72.7% male, 27.3% female (reference), it is now a much more balanced 52.5% male, 47.5% female. As such, with a much higher proportion of women taking part in the workforce, it is not surprising that family incomes have risen so significantly, and as a result the tax bill has gone up as well. The increase as a proportion of total family income has been less significant. Nonetheless, putting aside these omissions of context for a moment, I will concede to the Fraser Institute that it is worth noting that the proportion of the family income going to taxes has increased from 34 to 42%. (Editorial note: though conceding, I must admit, I do it with some reservation – the text provides no sources as to their calculations, and it is unclear if there is anything more to this study than this 395-word news release). Though this may still be a notable increase, there is one small bit of history that is not mentioned. The selection of 1961 as a starting point appears very apt for their thesis as it immediately precedes a rather important government program – Medicare. In 1961, all the provinces agreed to the Hospital Insurance and Diagnostics Services Act (precursor to the Canada Health Act), and clearly, thereafter it brought with it a significant increase in government spending. Given that Canadians voted Tommy Douglas – ‘the father of Medicare’ – the Greatest Canadian in 2004, I would gather that there is a large part of the population that feel that this was a worthwhile expenditure. Despite my protestations as to the informative value of the Fraser Institute’s ‘report’, we should of course always keep an eye on how our governments spend our tax dollars. Nevertheless, taking economic lessons from the Fraser Institute is not something I would recommend. Though the news release identifies themselves as an ‘independent non-partisan public policy think tank’ it is worth knowing their raison d’être. For one, though described as ‘non-partisan’, given their mission statement states that their vision ‘is a free and prosperous world where individuals benefit from greater choice, competitive markets and personal responsibility’, it is not much of a question as to where they might fall along the political spectrum if forced to endorse a political option. Furthermore, a list of their more significant donors would reveal both oil giant ExxonMobil and American billionaires, the Koch Brothers. If you are unfamiliar as to the implications of being supported by the Koch brothers, please do take a look. Finally, though I might further dispute the Fraser Institute’s charitable status, I will not try to stop them from having a voice. Having said that, I would simply like to add my own opposing voice to the conversation. ADDENDUM: Funny numbers aside, I wanted to point out some interesting manipulations made in the infographic. Specifically, take a look at those money bags. Though we might concede that the numbers are accurate, the size of those bags seems a little strange. Looking at the bags on the left, I would swear that the Basic Necessities money bag is way more than twice the size of the Taxes bag even though it shouldn’t even be that big given the 34% to 57% difference. It turns out the graphic artists has decided to proportion the bags according to the bag’s diameter (not the bag’s area which would more appropriately represent the amount of money in them). As such, once again, the Fraser Institute manipulates and exaggerates for the effect they desire. Though perhaps this is a minor offence – I suppose there are no specific rules for infographics as long as you use accurate numbers – as someone who loves numbers (and graphs, and infographics), I must admit I felt even further perturbed by the Fraser Institute’s manipulated presentation of the underlying facts.